New Zealand honeysuckle tree. 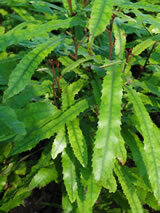 Tall narrow tree with deep green leaves up to 15 cm long, with a distinctive reddish-brown tomentum on the undersides. Stunning reddish-brown flowers along the branches in summer. Highly attractive to native birds for their nectar. Needs protection from cold conditions when young, but hardy once established, needs well drained soil and sun or semi-shade.